Earendel, 1969, oil on canvas, 90 x 121 in. Squares of color, placed carefully on adjoining vertical panels, move in space––forward/back, up/down, across––mark weights, move the eye. The sense of empty and full gives rise to the reference to a musical notation, one with sounds and many silences, but with passionate order. 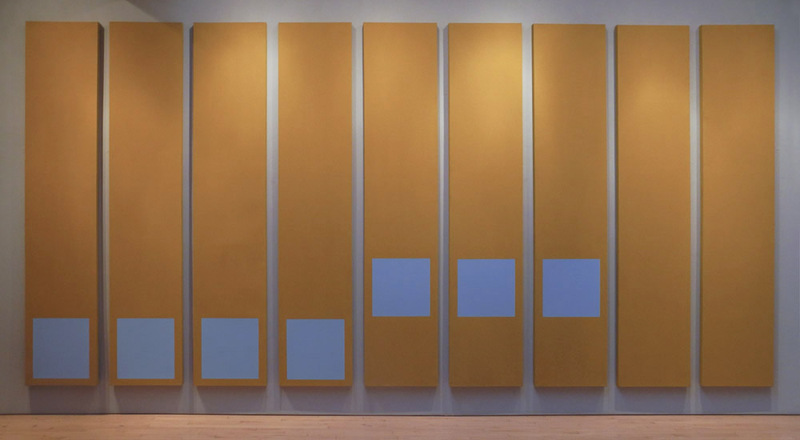 In the current exhibition at Washburn Gallery, Doug Ohlson: Panel Paintings from the 1960s, we can see four very large, ambitious paintings, each with a different quality of color, light, and rhythm. I love Earendel's offbeat balance, with colored squares of intense and subdued hues. From the irregular placement and varied hues of the squares I got a sense of buoyancy. The squares are very carefully painted with even brushstrokes moving the paint vertically. The ground color is laid on with no visible touch at all, so becomes a boundless space. Howick, 1967, acrylic polymer on canvas, 92 x 76 1/2 in. Howick is a beautifully mysterious painting, with colors that are dark, yet incredibly rich. There is a subtle iridescence in the brown paint, impossible to show in a photo, that adds a quality of light within darkness. 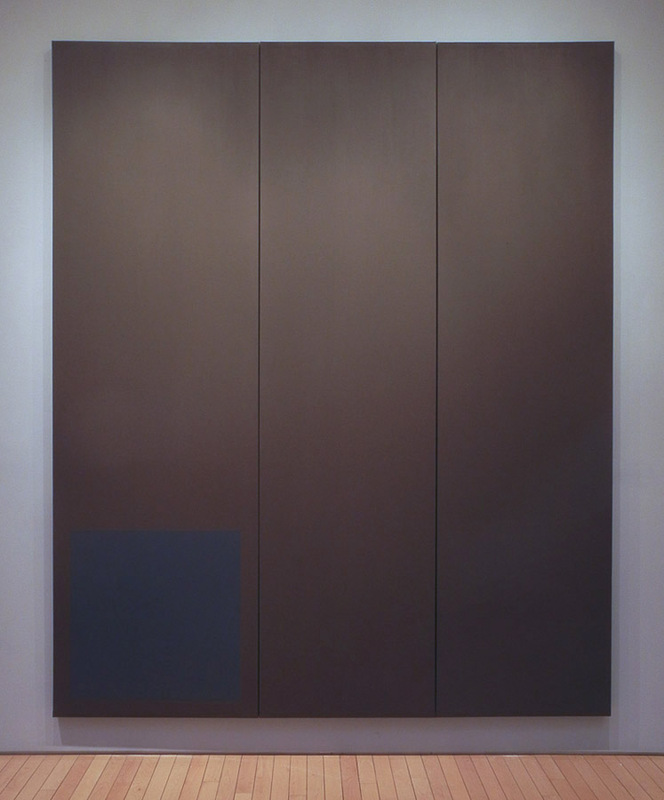 The painting asks for long contemplation, similar to that required by an Ad Reinhardt painting. 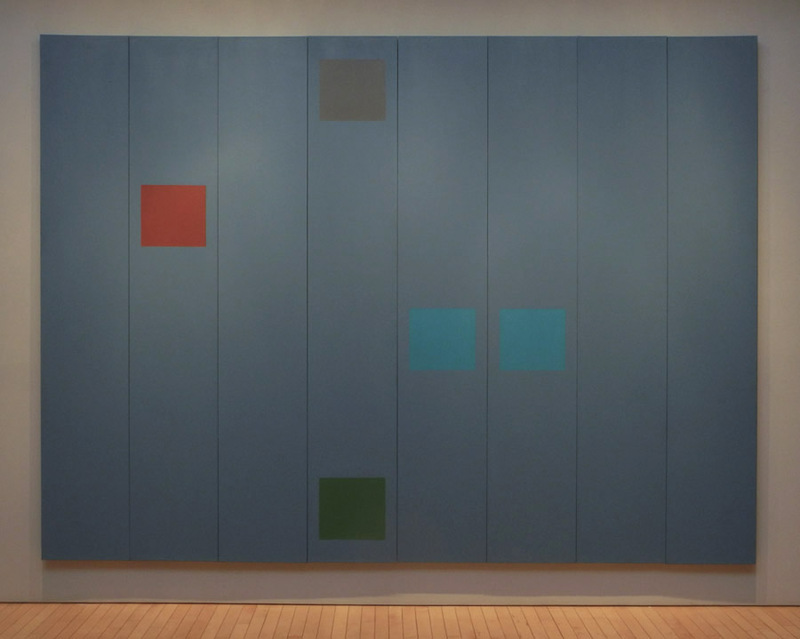 Another thing to notice is that in this painting the panels are not of equal width as are all the others; the panel containing the square is slightly wider, as though to accommodate it, to emphasize its importance even though its color is quiet and unassertive, almost not visible. Sterne, 1967, acrylic polymer on canvas, 90 1/4 x 186 in. Cythera, 1967, acrylic polymer on canvas, 90 7/8 x 207 7/8 in. 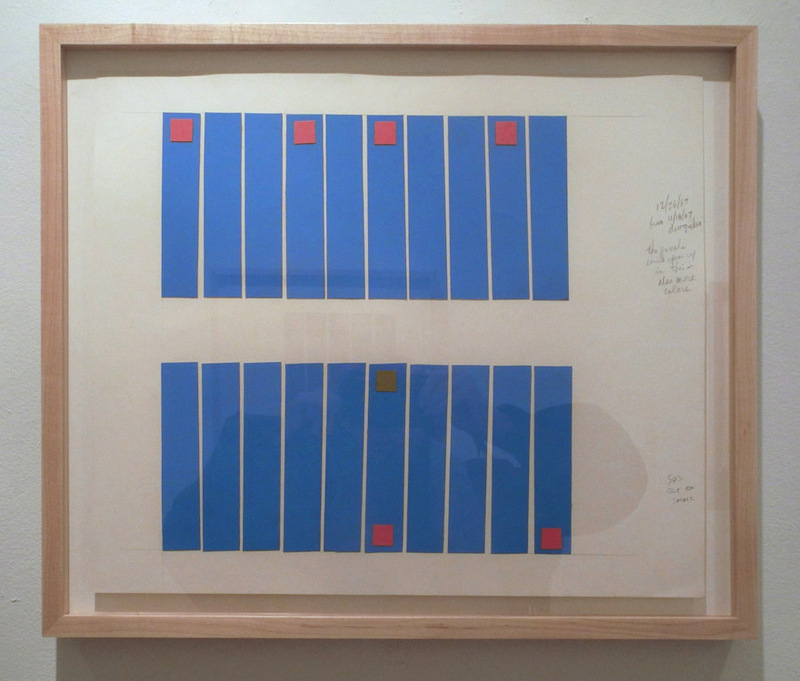 ....and in Cythera, the panels are slightly apart rather than joined, creating a more insistent rhythm between them; the small jumps in space read almost like passing time, especially since the works are so large, 15 and 17 feet across. 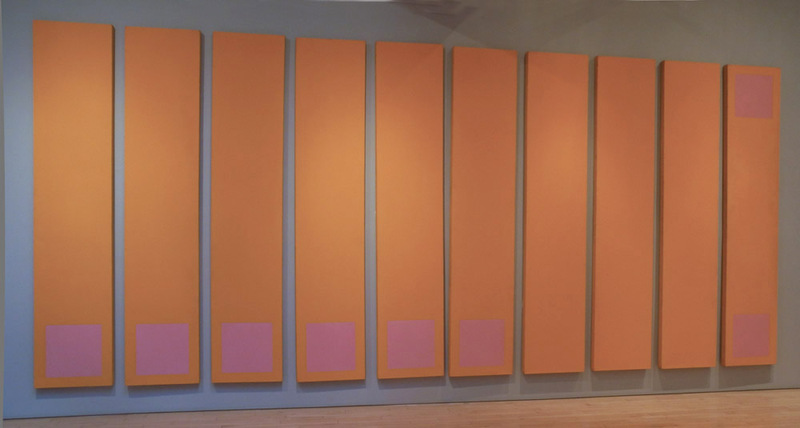 Larger than body size, they require distant viewing, then invite us closer, to walk past each panel, experiencing the changes over the entire painting. Color is carefully balanced for a expression of contrast or of subtlety. I don't know how accurate my photos are regarding this important aspect of Ohlson's work: the color on the gallery's website is very different from that in their small catalog of the show, and my color is yet a third variation on the actual paintings. 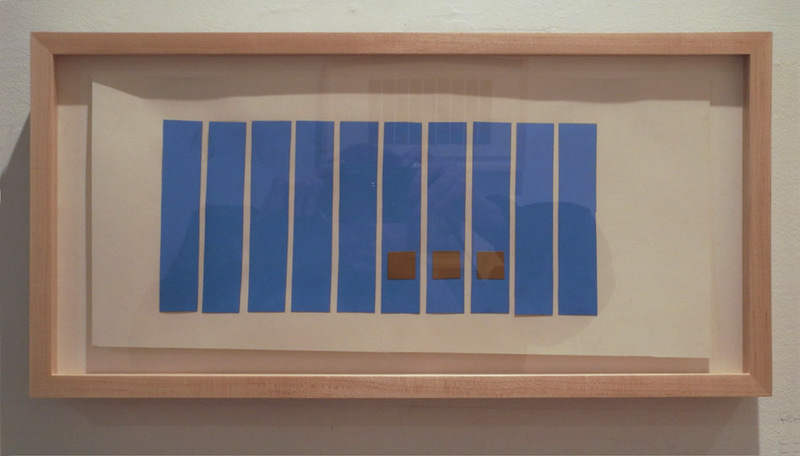 The above and the following are all Untitled, 1967, colored paper on paper. 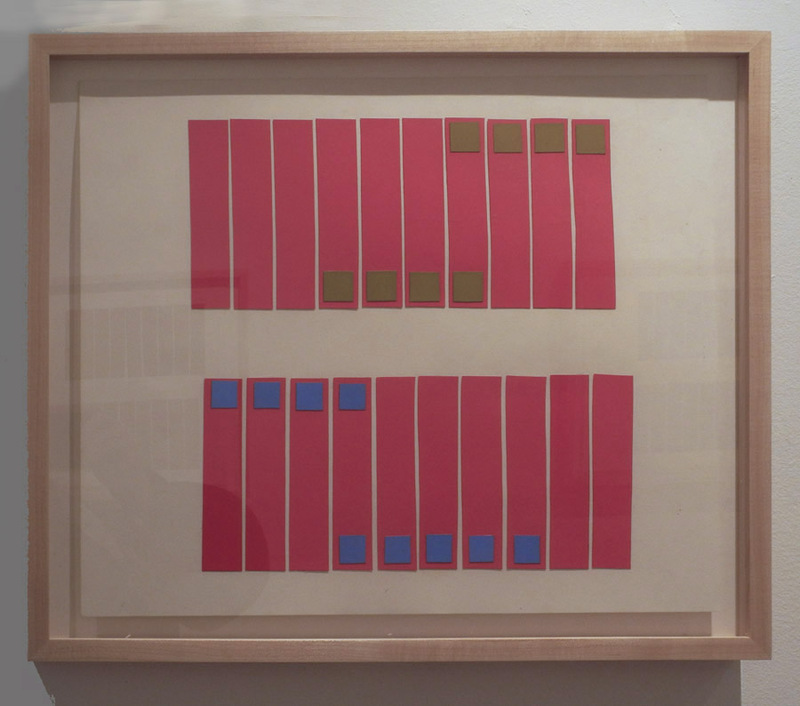 Ohlson worked out his compositions from small color studies. In them we can see his play with color and balance. He made notes to himself alongside this study. At the top right is written "12/26/67 from 11/18/67 drawing idea, the panels could open up in this - also more colors". At the lower right: "sqs get too small". I love seeing the variations of placement and color of squares and how it changes the feeling of each piece. With only 3 squares on 9 panels the intervals between the left side panels become even more important as they lead up to the emphasis of the brown squares. The difference in hues makes the blue advance visually or settle into the same plane as the surrounding greenish brown. Here are two ways of approaching cool reds, with unsaturated and saturated color squares. 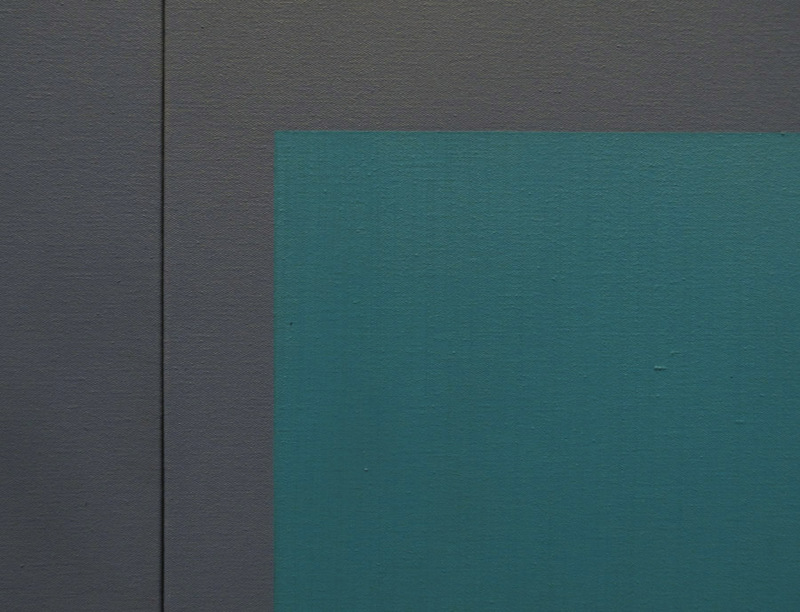 Although the blue is cooler in hue, it is so intense that it pops off the surface, while the greenish squares stay put. There is also the playing with balance: which works better, the upper squares on the right or on the left? four squares at bottom or five? 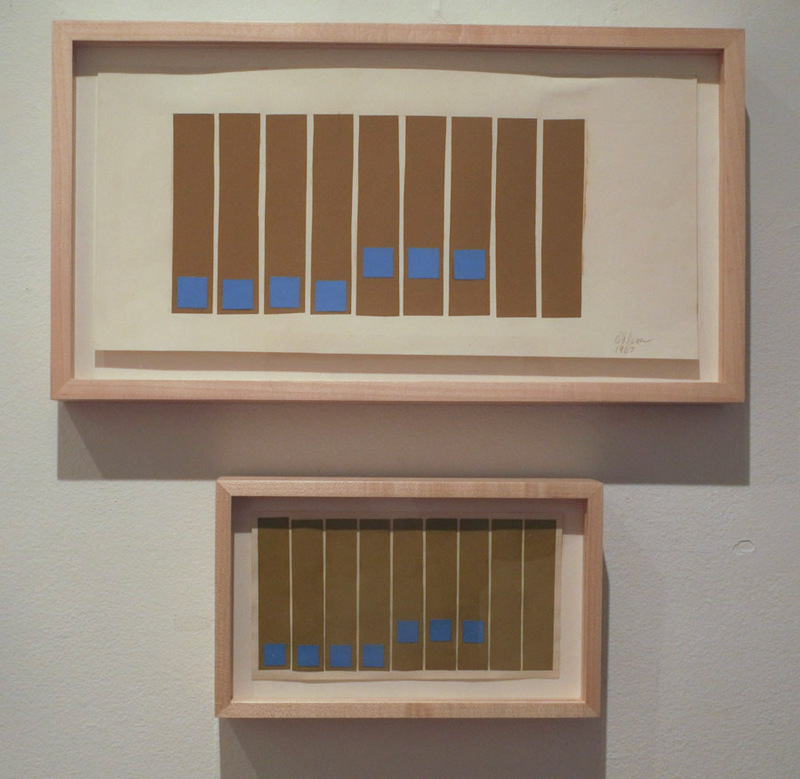 Within the seeming simplicity of the elements he uses, Ohlson explored complex issues of color and placement of form, and of enveloping presence.